Some books just wow me! I audibly gasp when we discover what's inside. Sometimes it's because it's something I've been anticipating, sometimes it's because the story melts my heart, sometimes it's because the artwork is just incredible. But sometimes it's because the book is just so clever. 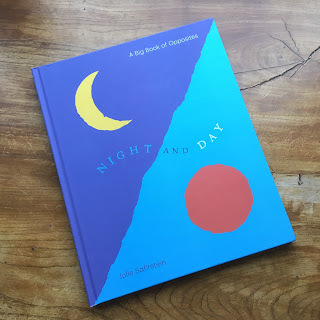 This is an oversized book that is filled with opposite words: night and day, high and low, open and closed, as well as other basic vocabulary like numbers. But it goes beyond simple pictures to represent the concepts. It brings them to life. Truly. Colourful pop-ups, lift-the-flaps and cut-outs create an interactive book that is packed full of bold and modern graphics that will engage little ones with the concepts. It starts quite simply with big, small, large, tiny with appropriately-sized coloured blobs on the top of flaps and similarly appropriately-sized objects underneath. Then numbers, with spots on top, numerals and fingers underneath alongside toddler-sized hands representing left and right (which BookBairn just loves to high-five). But then it starts to get cleverer: pages that pop right out to show objects that are outside and inside, in front and behind where children can literally reach through the pages to discover in 3D what the positional language really means. Next, a circle that slides to the top of the page to represent being alone and then to the bottom to join it's fellow shape friends to represent together. Another sliding circle moves from 'next to' to 'in the middle' to 'far' allowing little hands to bring these concepts to life. With braille-style bumps little fingers can explore 'straight' versus 'curved' and pop-ups that show above and below. And just to outsmart me (genuinely took me a day to figure it out) it says 'open' on the final page (I couldn't figure out where it's partner 'closed' was) and then of course you turn the back cover and close the book finding the word 'closed' on the back cover. Genius. *Disclaimer: this book was sent by the publisher at our request. As always words and opinions are our own. I was intrigued when I saw the pictures of this and can honestly say it's a completely original and showstopping book. I want one! I can’t wait to see this book. It sounds fabulous. I thought you had already played with this one? We will need to sort that out for your next playdate! Where can I get this book? I can't seem to find it to buy online apart from America. It looks like an amazing book. 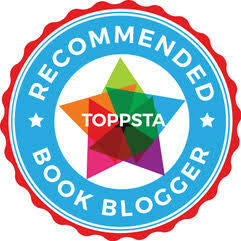 I was sent it by the publisher - have you tried The Book Depository? They do free worldwide shipping.